The top line here seems to say Clam Chowder and Clam Bouillon, which probably relate to E. S. Burnham & Co. whose sign appears on the west wall of this building. (See the previous image for the story of E. S. Burnham.) There is even a faded suggestion of Hasty Jellycon (a Burnham product) on the second line down. The bottom line, however, clearly reads New England Biscuit Works, and here I have not been able to make any connection with E. S. Burnham. This seems to be a completely unrelated enterprise, and to have been short-lived as a business in New York City. The company is listed in Trow's New York City Directory in 1889 and 1890, but not afterwards. The 1890 directory indicates that the president was Emil M. Perhacs and secretary was Albert C. Barnes. Two stories appeared in the New York Times relating to New England Biscuit Works. The first cited a fire at this location 21 August 1889, and the second (12 March 1892) told of Mrs. A. K. Whitner of the Gramercy Park Hotel who invested $13,000 in the stock of the New England Biscuit Bakery, of which E. M. Perhacs was president. Perhacs had told Mrs. Whitner that he was a minister. Mrs. Whitner was listed in Trow 1890 as "Whitner Mary A. E. crackers, 57 Gansevoort, h 321 W. 14th." The Reverend Emil M. Perhacs was listed in Lain's Brooklyn directories in 1888 and 1889, living at 122 Duffield St., Brooklyn. His occupation was "crackers." He also was recorded in the U. S. Census of 1880 as a boarder at this same address. He was 25 years old, an immigrant from Hungary, and his occupation was "bakery." In 1894 the Rev. Emil Perhacs was arrested for petty thievery at a Brooklyn bath house. At the time he held the position of assistant pastor of the Reformed Catholic Church in Cumberland Street near Lafayette Avenue, Brooklyn. A jury acquitted him of the charges. At the time of the arrest Perhacs stated, "Why, when I retired from business, in 1889, I was rated in Bradstreet's as worth $80,000" (New York Times, 18 April 1894, p. 9). 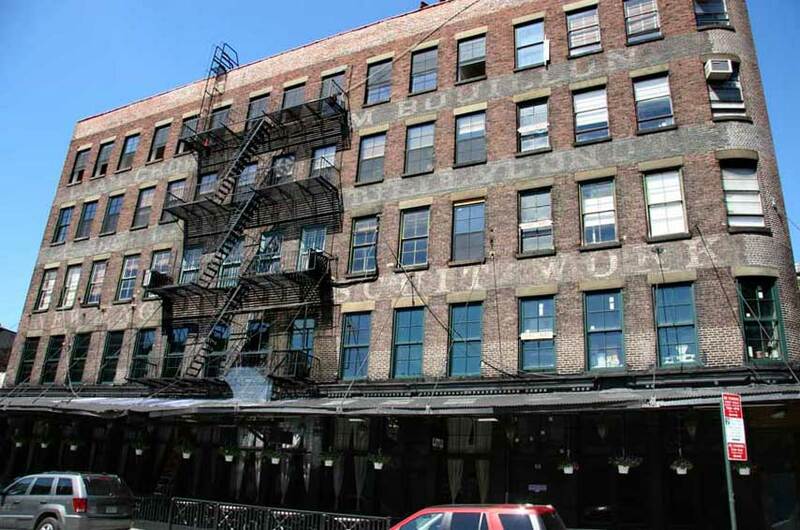 The Gansevoort Market Historic District Designation Report (New York City Landmarks Preservation Commission, 2003, pg. 166) gives the following information on 53-61 Gansevoort St.: "Date: 1887; Architect: Joseph M. Dunn; Builder: Michael Reid; Original Owner: Robert and Ogden Goelet; Style: Vernacular; Stories: 5; Facade Materials: brick, stone, cast-iron storefronts, metal canopy." Among commercial tenants, the reports lists New England Biscuit Works in the single year 1889.